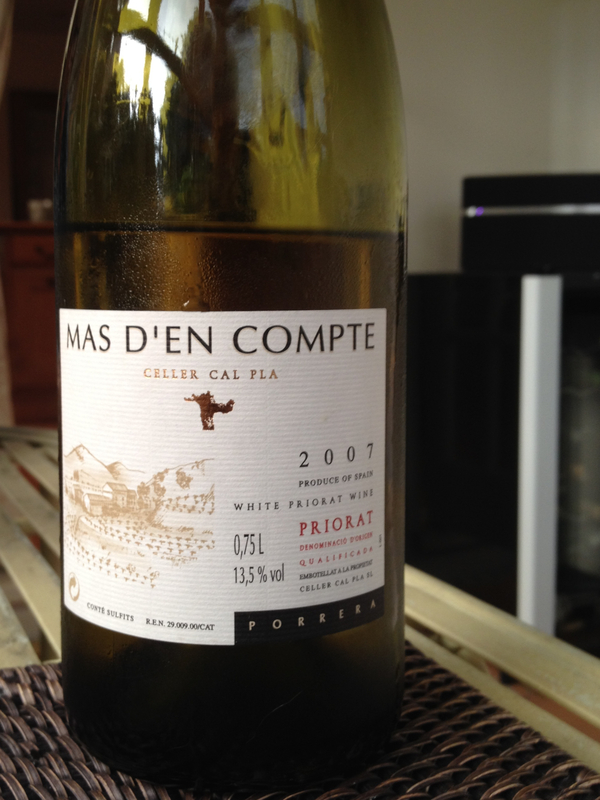 Mas d’en Compte 2007 is a white Priorat with an ABV of 13.5%. This region – remote, hot and dry – is better known for its reds, and, as all the reference books state, white wines are only a very small part of the production. Alcohol levels are usually on the high side for both colours as day-time temperatures can get to +40 deg. Fortunately, very cool night temperatures help the grapes maintain some acidity. So this was an interesting wine to try, even more so as it was a kind gift to Richard. The wine had been opened 24 hours but had evidently not changed one iota – which, in itself, is proof of its power. The colour was a deep gold with lemony tints and, despite the ABV, did not evidence notable windows. The aroma was strong and complex, with some acidity, and, at various sniffs, reminded us of ripe melons and peaches with Richard opining a slight burnt caramel smell. We did struggle with the palate description, however. Words such as weighty, rich, very long and complex came easily as did the nice balance of acidity and power. But from that point onwards we were searching for words. I tentatively suggested earthiness but that really didn’t do it justice as it wasn’t particularly rustic. Great to drink, it had some heat on the back-palate but not unpleasantly so. Again, research showed that others writers struggle to get past the words above, so we aren’t alone. The dominant (50%) grape is Grenache Blanc but this powerful white grape can oxidise quickly so it is balanced with Picpoule (for the acidity) and Xarel-lo. Richard, the budding Masterchef contender, matched this with asparagus, scallops, mint oil, brown shrimps and tartar sauce – there are a lot of big flavours there. I’m sure it coped with them. Syrah and Sauvignon are grape varieties that have been catapulted into the public conscience by the New World. They were both bubbling along in France, hidden by the labels of Loire and Bordeaux (Sauvignon) or Rhone (Syrah) and the French preference for ‘terroir’. New Zealand grabbed Sauvignon whilst Australia took Syrah and turned the perceptions of the grapes into something completely different – wines that declare themselves, wines that front-up, wines that swagger. But, sometimes, we prefer the gently persuader. This Syrah was one of those. Jasmin’s Cote Rotie 1997 was a mere 12.5% ABV – a hand-grenade of a wine compared when with the fruit bomb of a 14.5% Australian Shiraz. This was 100% Syrah. Its blood-red colour could be discerned, though it was impenetrable and had a black heart. This suggested very fine sediment and Richard confirmed it had not undergone any filtering. The nose had a slight menthol quality and very delicate perfume (which ,I declared, reminded me of a soap) but another writer stated as Germolene. (lovely!). Yet, underlying this was a rusticity, giving it some gravity. On the palate it was smooth, light and belied its seventeen years, being dry and structured enough to return without the mouth feeling coated. Without any of the residual sweetness so prevalent in Aussie Shiraz, it was gentle but savoury to the end. 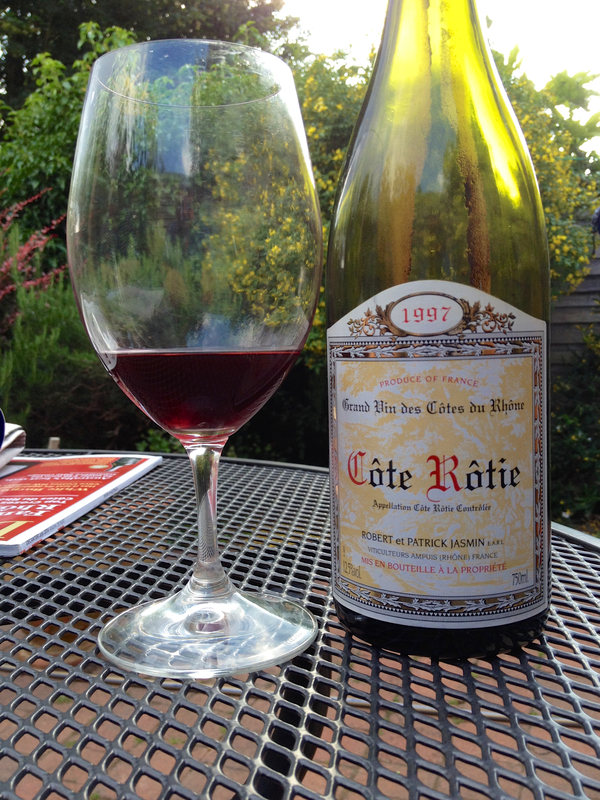 No garden ‘Barbie’ wine this, but one to enjoy with calves’ liver (great idea from Richard) on a quiet night indoors. And some times a flavour will stop us dead. These moments live in the memory and become benchmarks by which other wines are evaluated. Friday was one of those moments. 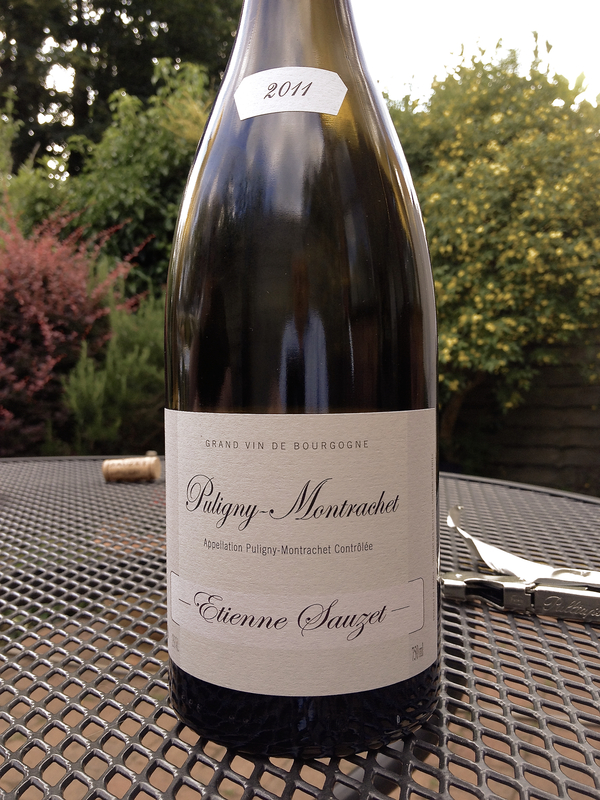 Sauzet’s Puligny Montrachet 2011 (Wine Society £39) is not a cheap wine by any standard – but an expensive wine has more to do to impress than one at £6. More is expected of it; this did not disappoint. The colour was a clear, bright pale lemon with a distinct green tinge; there were some windows. The nose was one that could be experienced time and again – each occasion being different to the last. Initially, slightly white peppery, this faded to be replaced by a freshness of acidity that was restrained, slightly austere and then another change to a very slightly honeyed note as the wine sat in the glass. The tastes were equally complex. Lemony-lime flavoured immediately, the palate was dry and very long with a very slight vanilla flavour – suggesting some oak contact. We thought of greengages – as these typified the slightly underripe refreshing quality. This was a powerful wine yet lean and restrained in its power. As the wine developed in the glass it became richer in its flavours. A wine of delicacy and finesse. Personally, if I’m going to spend £40 on wine for a special occasion I’d rather buy this than a bottle of champagne at the same price – but it demands a more serious approach. Perhaps that says more about me than the wine. 24 years old and 24 hours open. Tasting two versions of classic blends was Friday night’s ‘challenge’. The wines were variations on the GSM blend, both French and fourteen years apart in their vintages. 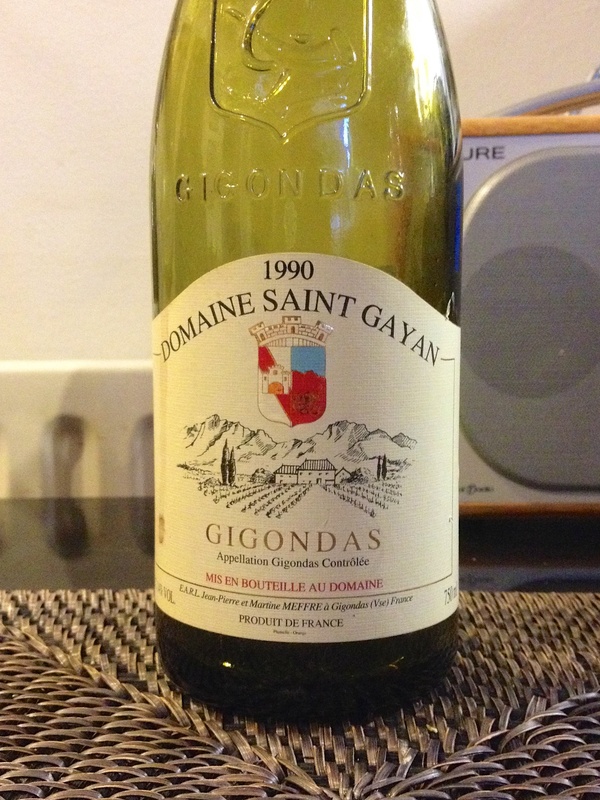 The first tasted was Domaine de St. Gayan, a Gigondas from 1990 with an ABV of 14%. 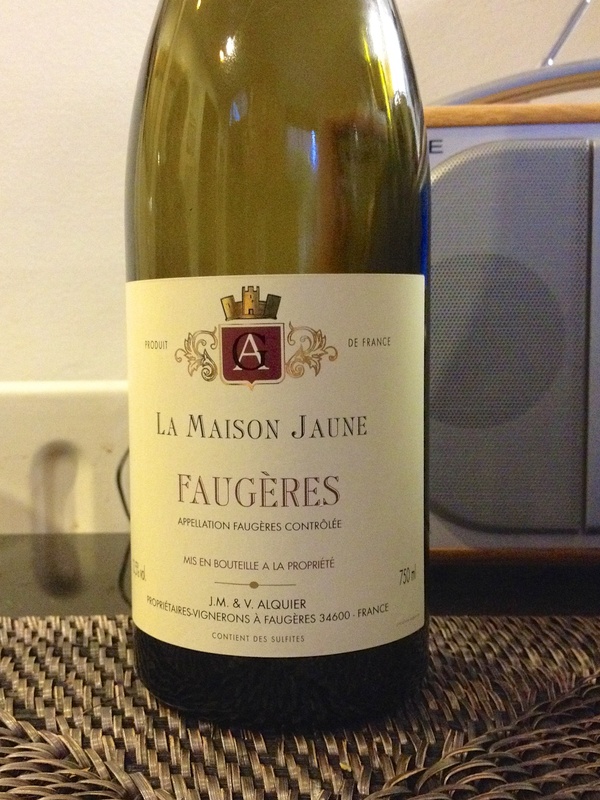 The second wine was a Faugeres, La Maison Jaune (13.5%) from the 2004 vintage. This bottle had been opened 24 hours previously. The blend for the Gigondas was 80% Grenache, 15% Syrah, 4% Mourvedre and 1% Cinsault. The Faugeres’ cocktail was a more straightforward 70 – 20 – 10, GSM mix. Both wines were deep red, almost black in colour with quite pronounced windows. Both had similar brown edgings. Their differences started with their respective bouquets. The Gigondas had quite a vegetal nose with some attractive sweet quality and slight menthol notes which faded after 45 mins. The Faugeres’ nose was not very forward, maybe with a slight menthol quality. The predominant taste of the Faugeres was that of earthy spice; it was a big, robust wine that still had plenty of power but possibly fell short in finesse. Certainly, as Richard said, it was a ‘day two wine’. The Gigondas had a rich, long aftertaste and still possessed plenty of power and structural tannins – despite being 24 years old. There was also a beguiling slight sweet-fruit edge to it – something the Faugeres’, in its earthiness, lacked. The Gigondas had the higher acidity as well as greater refinement. There is something in this menthol – or maybe it’s better termed as aromatic – nose. We keep getting it with pure Syrah or blended Syrah wines but it fades fairly quickly, which suggests delicacy. It will be interesting to see if this quality is repeated in the ‘bigger’ Syrahs of Australia.